The Izunagaoka Spa is located in the north central areas of the Izu peninsula in the Shizuoka prefecture. It is 90 minutes away from Tokyo by Shinkansen (bullet train) and Zairaisen (conventional railway line). 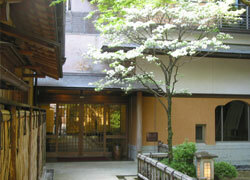 This spa is a perfect blend of the historical Kona Spa and the comparatively modern Nagaoka Spa. Surrounded by mountains and rivers, the spa has abundant water gushing out from the springs and is well known for its 'drinkable spring water' since ancient times. The panoramic view of Mount Fuji from Mount Katsuragi is unparalleled in its beauty. The Kano River that flows along the Izunagaoka city is famous for Ayu (sweetfish) fishing. Thanks to the mild winters, you can spend leisure time here any time of the year. Hotel Kona Besso is a luxurious spa hotel with 8 independent cottages which give you a taste of traditional Japan. These guest rooms (tea-ceremony house style) allow you to savour the highly valued architectural beauty of Japan; these rooms have been home to many visiting dignitaries. Many reasons could draw you to our spa, it could be the medicinal hot springs,, the gardens ever blooming with seasonal plants, the traditional Japanese furnishings or could be the fact that the succulent traditional Japanese course meal (tea ceremony foods) served here is a beautifully presented work of art. Whatever your reasons, come and spend a few memorable moments at the Hotel Kona Besso and savour the beauty of Japan!